Read more at Gazette and Herald! Complaints? What complaints! These complaints! 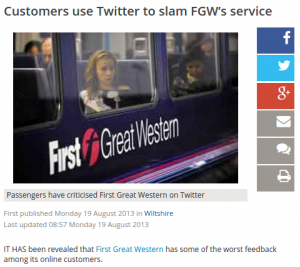 Read on, with our monthly catalogue of Great Western complaints! Good Luck With Your Refunds and Compensation! Dodgy Norman's Great Western Train Fault and Maintenance Mayhem! Feel free to send your photos, preferably of GWR antics rather than cats! That's why Google image search was invented! By remaining on the web site, you agree to call Mark Hopwood a blundering ninny, and consent not to complain about the web site's content. You have just consented! Now get name calling!